Images taken by Lina Dib using Microsoft’s SenseCam. Drawing on the analogy of a box filled with mementos, stored under the bed, or in the attic, in 2008 Microsoft Research developed and tested a prototype they termed the Family Archive. The archive as a unit looked like a small wooden desk and consisted of an interactive touch interface, which was part screen, part scanner, and part digital storage for the scanned images. Using the family archive, test users could upload pictures and scan images of objects around their home for later retrieval. The system was intended to act as a practical tool to organize and archive family memories in a digital age. However, test users did not use the archive for organizing their photos into neat little digital boxes. They found the modes of ordering that the device offered were messy and hard to work with. But “systems work because they do not work. Nonfunctioning remains essential for functioning.” We will return to this apparent design failure in a moment. Another Microsoft Research prototype, the SenseCam, is a wearable badge-sized camera equipped with light, temperature, and position sensors. Based on the sensors, it determines when to take a picture and record information. The SenseCam was initially designed in 2004 to help people with memory loss such as Alzheimer’s or amnesia. As the story goes, one morning its inventor misplaced her keys and decided to design something that would remind her of where she had left them. This prototype has generated a tremendous buzz; capturing the public’s imagination as the penultimate tool to seamlessly and ubiquitously (one doesn’t even have to push a button to take a picture) upgrade our often dubious memories. Never forget a place or face again! it won’t be the end of the game. restore everything as far as your last saved brain. Of interest however, is not the promise of perfect memory, but the way prototypes embody ideas and hopes; and are created to debunk, complicate or reinforce those very ideas. In doing so, they often act as catalysts for fresh ones. Prototypes are tools to think with. They are particular and telling objects in that they represent at once the idealization of what is to be built as well as the rudimentary, necessarily incomplete experimental processes in which such building occurs. There is an iterative quality to the prototype that implies intrinsic plasticity and rapid exchange between the world of concepts and the world of things, a rhythmic and temporal flux that separates it from mass-produced artifacts. Back to apparent failures: in several studies, Microsoft has shown that reviewing SenseCam pictures does help support patients with memory loss. Yet, these memory-producing prototypes display certain conceptual contradictions. Firstly, the term prototype connotes speculation and the future. Yet these up-and-coming objects specialize in generating a retrievable past. They are in a sense constructing the archaeology of the future. The irony however comes with the problem of organizing and contextualizing the innumerable images captured by the device. Faced with so much information, one wonders whether it would be less tedious to simply forget. Since my participation in test uses of the SenseCam, I have never looked at my pictures in order to remember something I did or ate in the past (note: I’m not clinically amnesiac). However, I have enjoyed the aesthetic serial qualities of sequencing the images, and have occasionally indulged in revisiting random days from my past. The astounding volume of photographs makes it virtually impossible to predict which historical moment I will stumble upon. It feels like a little surprise every time I click on a file. 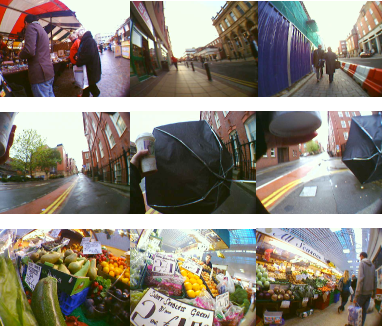 When Microsoft tested the SenseCam with users who did not suffer memory loss, they discovered that people liked how the fish-eye lens made the ordinary look extraordinary. Moreover, by tying the unit to a dog, they discovered the possibilities of seeing the world in new ways. What the makers of both the Family Archive and the SenseCam discovered through test uses was that they were supporting more than mere collection and recollection. Their detailed field studies revealed that they had created instruments that touched on the generational obligations of organizing the past, the desire to store things out of sight, the possibilities for making art, for telling stories, and for surprising oneself and others. Although built with a specific purpose in mind – supporting memory and providing a solution to the problem of forgetting – these prototypes’ were nonetheless imbued with possibilities. Untethered from their original function, prototypes are more like receptacles for potentialities than resolute objects in the world. When treated as receptacles, they foster innovation, imagination and creativity. “Inventive thinking is unstable, it is undetermined, it is undifferentiated, it is as little singular in its function as is our hand.” Like Serres’ hand, prototypes have the opportunity to become what they grasp. Thus the promise of the prototype is not so much that it does what it was built to do, but rather that it breaks free of its intended function while fostering a conjectural quality and embracing multiple futures. This year the SenseCam can be said to have gone from prototype to product. Production rights have been purchased by Vicon, a company specializing in motion capture. At 500£ each, they cater to academic and research markets. Vicon and Microsoft now host an annual SenseCam conference that brings together research on its applications. In doing so, they might be embracing what this conference refers to as a prototype culture, or a more ‘seamful’ and democratic approach to their designs, encouraging others to engage the device, propose modifications, and proactively spur on its evolution. As Guggenheim puts it, prototypes are becoming allotypes; or to adopt Serres’ term “quasi-objects.” With SenseCams being continually appropriated for reasons ranging from the construction of reliable, viewable histories for amnesiacs, to the creation of poetic visual narratives, the users take a leading role in elaborating their eventual incarnations. Michel Serres, The Parasite, trans. Lawrence R. Schehr, Minnesota, University of Minnesota Press, 2007, 79. AF Harold, BBC4, Oct 04, 2007. Hodges, Steve, et al., “SenseCam: A Retrospective Memory Aid,” presented at the 8th International Conference on Ubicomp, Orange County, California, September 16–19, 2006. Guy Debord, “Theory of the Derive,” In Theory of the Derive and other situationist writings on the city, Museu d’Art Contemporani de Barcelona, ACTAR Barcelona, 1996 , 22. Michel Serres, Genesis, Ann Arbor, University of Michigan Press, 1995, 34. Matthew Chalmers and Ian MacColl, “Seamful and Seamless Design in Ubiquitous Computing,” In Proceedings of Workshop At the Crossroads: The Interaction of HCI and Systems Issues in UbiComp. 2003. Michael Guggenheim, “From Prototyping to Allotyping: The Invention of Change of Use and the Crisis of Building Types,” this conference, 2010.